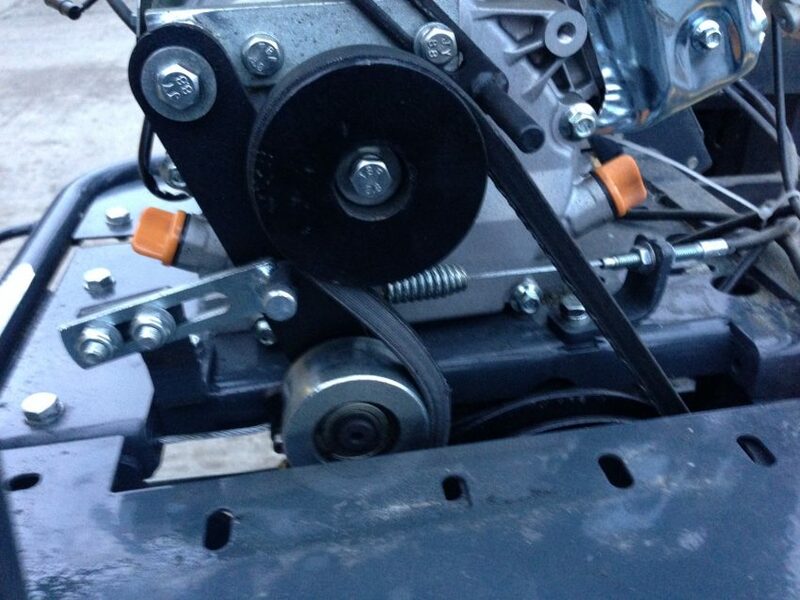 Your mini dumper will perform best when the drive belt and cables are adjusted correctly. All the mini dumper above use the same simple robust system. Operating the “Clutch Lever” (red handle on the top of the left hand handle) Has two functions both to tension the drive belt and to release the parking brake. The simplest adjustment and your start point is to turn the barrel nut on the front of the clutch lever counter clockwise. 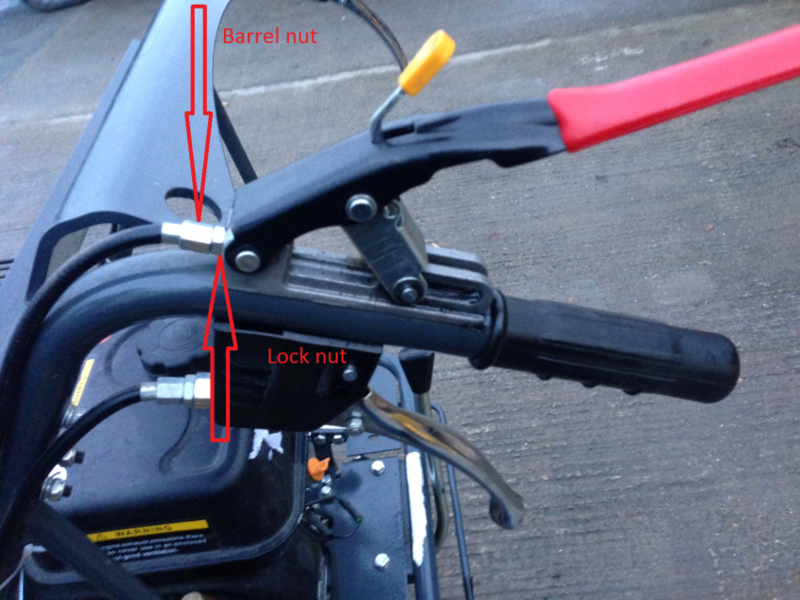 Only give the nut a couple of turns at a time and the tighten the lock nut when when the cable is at the desired tension. Note that over tightening will over stress the cable. When you engage the clutch lever the machine should pull away quite abruptly, a gentle take up would indicate the belt tension being to low and the dumper creeping forward when the clutch is disengaged would indicate the belt is over tight. 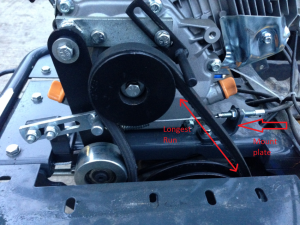 The belt being over tight will also cause difficulty in gear section. If you have to expose more than 10mm of the barrel nuts thread you should adjust the lower end of the cable. Remove the spark plug cap before starting work. 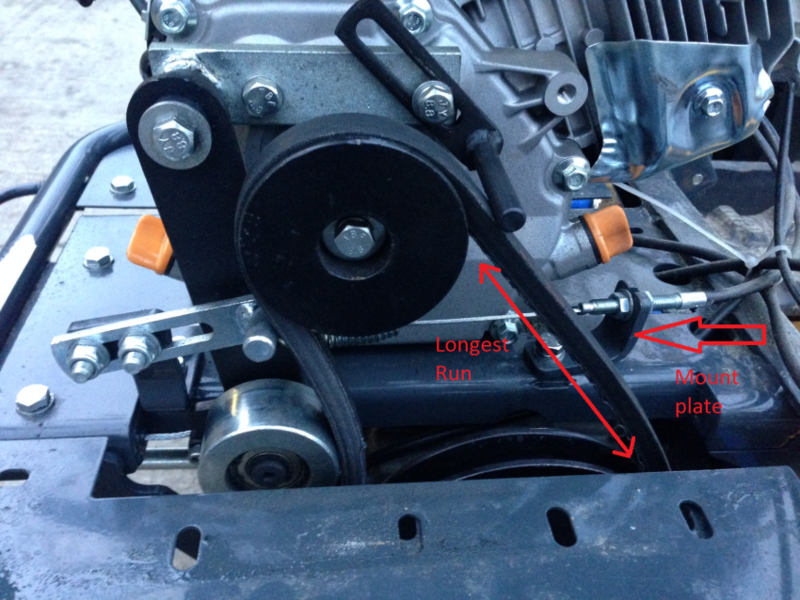 Remove the belt cover on the right hand side of the engine. You will see where the cable attaches to the mounting plate with two opposing M8 nuts. To adjust the cable wind the barrel nut on the handle all the way in (as seen in the picture above) you will then need to loosen the nut nearest the left of the picture unwind nearly all the way to the end of the thread. Hold the clutch lever down and tighten the nut nearest the right of the picture until the belt is at the correct tension. A good rule of thumb for any “V” belt is being able to twist the belt 90 degrees on its longest run. You can see that the picture on the right the belt is loose and the one on the left is tight.